My name is Frozan. I don’t have good memories from my life. None of it makes me happy. Since I was a teenager there were Taliban and fighting all around. They didn’t let us be literate. It’s been fifteen years since I got married. When the Taliban began fighting we lived in the rural areas, but then we came to Kabul. I dreamed of being educated and having a good family. I dreamed of my children going to kindergarten when I got married. This seemed like an example of a good life. You know how illiterate people live? For them, life is nothing. I have a twelve-year-old son. Sometimes I boil eggs for him to sell and sometimes I make bolani. He sells them in the late afternoon. He is too young to work for the family, but I was ill during the winter and had trouble talking and breathing. Educated people have different lives than us. They have at least 2,000 or 3,000 Afs salary. They can buy clothes for their children and themselves. What good memories do illiterate people have? None! My children go to school, but with thousands of problems. I want them to be educated so they don’t blame us, just like today we hold our village’s leader and parents accountable. I don’t want my children to become like us. I want them to have jobs and good salaries. But we are still afraid of the bad security in Kabul when children go to school. We are scared of attacks, bombs, and chemical weapons. I have lots to say, but what happens when I speak of my life: it’s no use. I am very tired of my life. Sometimes I feel like going to a room where there is no one and scream to die. I have no purpose. If I didn’t have children, I would have died many years ago. There is no money to treat my illness, nor is there for my husband. We rent a house and whenever my husband works I save 100 or 200 Afs. We focus on the rent rather than the food we eat. I might be thirty years old. What would uneducated people know about their age? While we were living in Kohistan, Taliban took three of my brothers and killed one of them and put the other two in prison in Kabul. My brothers had no food or clothes, so they asked us to come to Kabul. In Kabul, I got married. When my brother got killed two of his daughters remained with us, but we couldn’t afford it so one daughter was adopted by a family and the second daughter committed suicide when she was twenty-one. She was living with her uncle’s wife and she made her get engaged to someone in Iran. We are very sorry for what happened to her. I wish to have a house and have good school clothes and stationery for my children. Three of my children don’t have school books. The school year is nearly over, but they still don’t have books. Exams are on the way, but my children are not prepared. I told my son when he sells some boiled eggs he should buy books. My daughter is thirteen and has failed her exams. My children don’t feel good when they go to school because they say the other children wear good clothes and eat good food. When we were school age, our parents said, “the Taliban are here and you can’t go to school. What if they caught you?” We saw the news; there was no security. My parents weren’t educated. The Taliban took my brothers. The government took people for crazy reasons and put them in prison. My brothers were kept for three years. People were released if they exchanged money, but my brothers couldn’t do it. If my voice is heard by the government, I think security is the first problem that has to be worked on. Schools are not a safe place for our children and the teachers should be trained. Second, in Kabul we are scared of bombs and suicide attacks. Third, people who don’t have houses should have a place to live. By Frozan, as told to Mariam Y. Security. It is so hard to achieve much less survive without security. It is quite something to be able to read Frozan’s story. I feel that I have just learned a lot from her, and for that I am grateful. Sending her a prayer. May there be good luck, peace, and prosperity in her future. I am so glad that the AWWP is reaching out to those who cannot read or write. Their stories, like Frozan’s, are important for us all to hear. Communication is everything. To me, not having the opportunity to express your wants, desires, concerns and fears is perhaps the most oppressive thing of all. Giving these women a chance to have a voice is a beautiful gift. 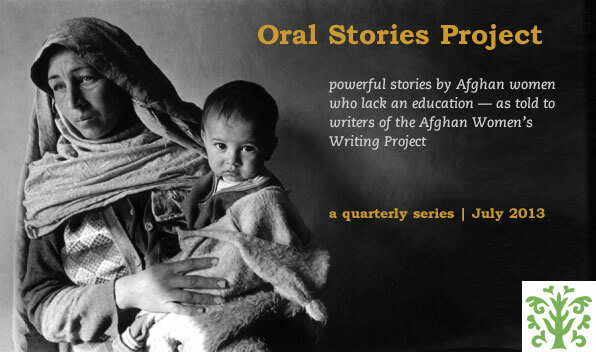 Frozan’s story is so sad but I’m glad that she has shared it so we can more clearly understand what life is like for so many women in Afghanistan. Thank you to Miriam for writing down her powerful message. Frozan’s story is so incredibly sad. If only there was more we could do for women like Frozan. Thank you for letting us know your thoughts. I pray there will be happiness in your life and your childrens. I really enjoyed Frozan’s story. Its very sad but I do thank you for sharing such an amazing story. Frozan story is so sad but she is a strong woman for still being around for children and would keep providing for them even if she wouldnt eat. she has had a life no one envys and i wish her the best for her children and husband topull through these tough times.